Hee hee hee. Okay, in my defense, I have not purchased a pair of shoes in quite a while. Years, I think. Which is how I found myself in desperate need of a new pair of respectable summer walkies shoes. And I suppose how the online bargain shopping floodgate recently opened, because, well, I had a need to feed and I really don't want to be shopping for shoes like, all the time. Cuz u know, I got a blog to write and goodies to make and a tiny and big boyfriend to play with. Tiny chumley of course, was rather disappointed as we made our way through the stack of packages that were on our doorstep yesterday. Sniffing first with great anticipation that his dieting days might be over, til realization set in that these were goods not meant to be either played with or eaten. ummm, r u sure this is what u were so exited about, mom? u cannot eat it or anything. - baxter, 5.4 years old, unimpressed and rather disappointed with my super cool thrift store score from yesterday. Alright alright, tiny chumley and I do need to take pictures of the duds we finished yesterday (hee hee, yep I'm talkin to u, Otto and Linus!) but well, I needed new summer walking shoes and heck I'll be passing the thrift store anyway and The Avengers doesn't start til 1:00 anyway so...wooty! I stumbled across the holy grail of vintage Pyrex Love. Well, technically half since I only found 2 of the 4 bowls, but who's counting? And I won't even tell you about the dresser that didn't have a price tag on it that so should have been mine. Not that anyone here needed one. Which is how it always seems to go when it comes to vintage scores. Yippee! A new happy doxie painting for tiny chumley's collection arrived from myfavoritethingsartstudio in the mail this past week. 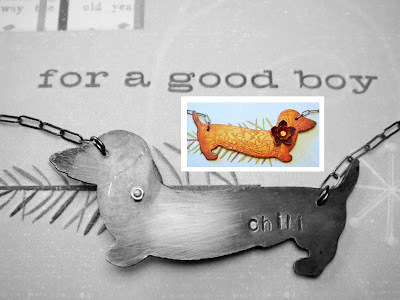 A piece of art I found on Etsy that is an almost exact match to the look we often get when the little kielbasa yearns for a snackie or just wants to know when things will get more interesting, so he can decide whether or not he should hunker down for a nice snooze in the sun. I suspect this won't be the last painting we receive from this Etsy artist. A fellow dacshund owner, myfavoritethingsartstudio also does custom work, and so I have been racking my brains thinking about which picture I might well commission her to turn into acrylic and canvas gold. Decisions decisions. I take so many pictures of the little kielbasa from the front that it's hard to remember there are other sides to him too, like the little mouse inspired top view I so often see when his interests are elsewhere. There are days in this fast paced world when I am reminded of what it is I should truly value. Of love and happiness. Of finding joy and beauty even in the most darkest of places, and in the most trying of times. It is all there if you look hard enough, though sometimes it is easier to see after time has passed. On the surface it might seem shallow to admit that I also value things. Material goods. Stuff. 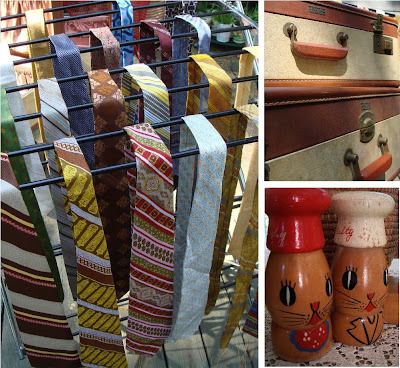 But like the collars from our boys and our ever expanding collection of vintage doxie stuff, sometimes things are all we have left to connect us with that which we have lost. Things can transcend their inanimate status and help us remember, and help soothe an aching heart. Things sometimes help where words cannot. Since offering my crafty ventures to the world I've humbly come to realize I am not alone, and I am honored by those who choose my work to help them remember and heal. A small tiding of comfort, to connect us with those no longer with us, whom we hold dear. For the families of dearly departed Chili, of Emma, of Tippi, of Stretch, of Tigger, and for families of all our beloved pets who will not be with us this holiday season, my best and warmest of hugs. Double posties today, cuz I'm a little bummed that haven't had much luck with Cyber Monday on the things I want or need to get. Which got me to thinking that somebody else out there might be feeling the same way about that special little sumptin on kalyxcraftopia. And so for you, turn that frown upside down and enjoy your very own Cyber Monday treat - coupon code, MELIKEYDAT10, good at the kalyxcraftopia etsy shop today for 10% off all in-stock items, including notecards, pupperina necklaces, jewelry, and yes, ready made flapjackies! Those who have followed kalyxcornucopia for a while now know that I started this blog mostly on a lark, to give warm and happy pauses in an otherwise seemingly 24/7 workweek for Big Boyfriend, to share stories and pictures of everyday cuteness that is our little boy Baxter. There is no charge to visit, no money being made based on clicks or cookies or anything of the sort. No annoying "relevant" ads, nothing here I don't really believe in, and no money being made without providing for an honest day's work - like say a nice doggie dud or a flapjack hat. It's the real deal at kalyxcornucopia.blogspot.com, and that's the way I like it. So I was disappointed to find out from our friend Sugar that a few other sources are now reposting kalyxcornucopia blogposts without having obtained permission of any sort, leeching in such a manner that I find truly reprehensible in both its misrepresentation and shameless demonstration of creative sloth. And, most concerning of all, exposing readers to possible spam, cookies, viruses, and other such unwanted ills. And that I cannot tolerate at all in this special and very tiny corner of the universe. Our road trip to Chicago started out as any other. Though this was an entirely new destination to which neither of us had driven, I had reminded Robin that we weren't successful the last time we tried taking a "scenic" route, hoping as we were to find all sorts of wonderful junking opportunities along our path to New York City. Nope, not a thing of interest last time we tried, and we have goals. Getting to Chicago. In one piece. With enough time to wrap up any loose ends before the show. And we don't have any time to do research. Let's take the interstates. So Robin agreed to take what Jeeves the British accented GPS told us to do. The shortest route. If we were lucky, we might have time left over to goof around once we got to Chicago. We made good time the first day of our road trip, so much so that by late afternoon we decided to give one of our friends a ring to do a little internet searching for thrift stores in towns near where we wanted to spend the night. There looked to be tons in a town whose name I now forget, so we took the exit and started our search. Meh, a couple of neckties at the only Goodwill we could find. I figured so much, I thought to myself quietly. And we were both getting hot and tired. Let's get back on the highway, check into our motel, and get sumptin to eat. Food options were running through my mind while Ophelia, our recently transvoiced GPS, kept recalculating different ways for us to get back on our path to Chicago. I tried to tell you I wanted directions to Wright Patterson Air Force Base but you wouldn't listen, Ophelia. So pardon me if I put you on mute while I help Robin look for signs. And there it was, stuck in the corner of strip mall, a shining beacon in the night, a serendipitous encounter that was meant to be. Behold, a Goodwill Outlet (cue choir of heavenly sounding angels). Up til a few months ago, neither Robin nor I would have known what the addition of that one word - outlet - meant. What some might view as dregs, unsold product from regular Goodwills, were now sold at the outlet by the pound or for a pittance. At this Goodwill Outlet, clothes were $1.39, books were 50 cents, and everything else sold on a pricing scale that encouraged a very weighty purchase, starting at around $1.39 for poundages under 20 pounds, and going as low as 59 cents a pound for weights over fifty pounds. Look hard enough and there will always be vintage gold. The Dana Buchman silk velvet ensemble that'll wash up nicely and be reworked into hats, the vintage mirror that we hung on our ladder shelf in the booth so folks could see how wonderful they looked in our hats and scarves, the lace curtains that I needed for our foyer window, hardback books with interesting cover art that I'm know I will need somehow, sometime. Pretty glassware that we would have purchased had we the room. We spent a couple of hours there and came out with a few bags of goodies before moving on to our motel for the night. But we both knew we were on to something. That night I googled Goodwill Outlet Indianapolis and furiously scribbled down addresses. Ophelia was in prime form the next day, programmed as she was to take us to three Goodwill Outlets before soldiering us on to Chicago. The stores, the goods, and the shoppers inside them were all different, all interesting in their own way. All full of inexpensive temptations. Junk to some, but to us, treasures awaiting their day to be transformed. We filled every nook and cranny in the van, hoping to do well at Bucktown so our purchases wouldn't look so space defyingly daunting to our patient and loving husbands. A bit of peeled paint on the wall of our NYC hotel room. A moose to some, but to me, a longhaired doxie, sitting on the beach, with ears blowing in the wind. The last leg of my journey today, home to big and little boyfriend. Yippee! Having been away now for six days from little boyfriend, I must say the withdrawal symptoms are definitely growing. Sure, we video chat every day, but there's nothing like physical presence, the feel of a little snuggly round sausage boy nudging against me when I write these posts, the sight of a waggy tail when I have food to share, the companionship of a four legged little buddy boy. And so, on Friday I resorted to bribing the cockapoo that lives at the place we are staying, luring him into loving me with tiny bits of watermelon and partially fulfilled promises of walkies. While his mom was away at work and we had the house to ourselves, Roscoe the cockapoo became my surrogate buddy, and we both hung out like two refugees brought together out of similar circumstances and needs. We developed an understanding, Roscoe and I, an arrangement. With no one else around, he was my lap buddy and I was his lap, and neither of us would let our respective loved ones know of our tryst. By Friday evening when the amazing miss Molly came to visit and Roscoe's mom came home, our relationship was but a memory. It was time to get a real doxie fix, and Molly was the perfect little pumpkin at Saturday's show, ambling about while her mom, Robin, and I worked, poking her head out from under the tablecloth with the perfect amount of cuteness to merit the snack that she knew was waiting for her. Her big brother Max had visited our booth earlier, making himself very useful as a model for one of Robin's hats. I am so impressed, by the way, with Molly and her big brother and sister, they all do so wonderfully of leash and heed their mom so well! I get the feeling if tiny chumley had his way, he would go everywhere with me. He'd be my little buddy dog, camped out by the meat section of the grocery store when not snitching samples from the deli, stuck to me like glue when we roam the aisles of the family friendly fabric store, and dutifully standing guard of my basket while I dug around in the bins at the thrift store like I did the other day. How I wish I really could take Baxter with me everywhere I go, cuz then I wouldn't ultimately face this when I get back home, after the excitement of my return wears off. Mister Perturbed Ears. Mister I thought we were friends and friends stick together. Mister Snootypants. Luckily, Baxter's bout with Mr Snootypants fades pretty quickly, and life gets back to being happy go lucky for this little boy. It's hard, really, to stay scowly when there are so many new things to smell. 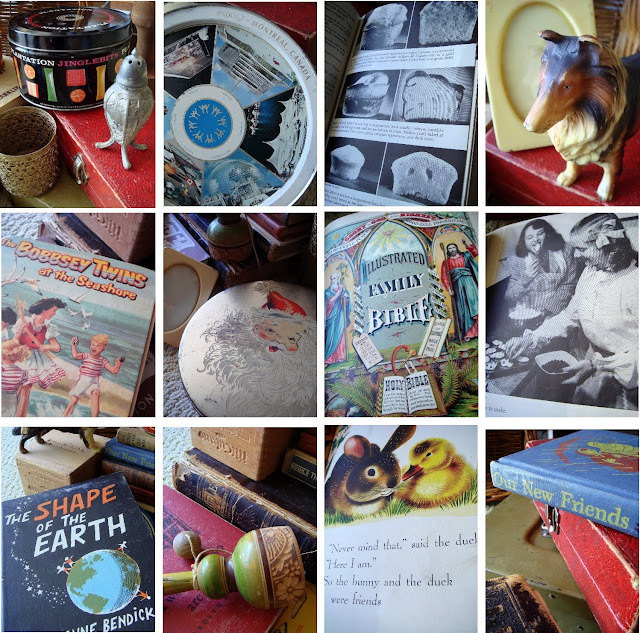 Like all the swell stuff I scored this week at the thrift store. 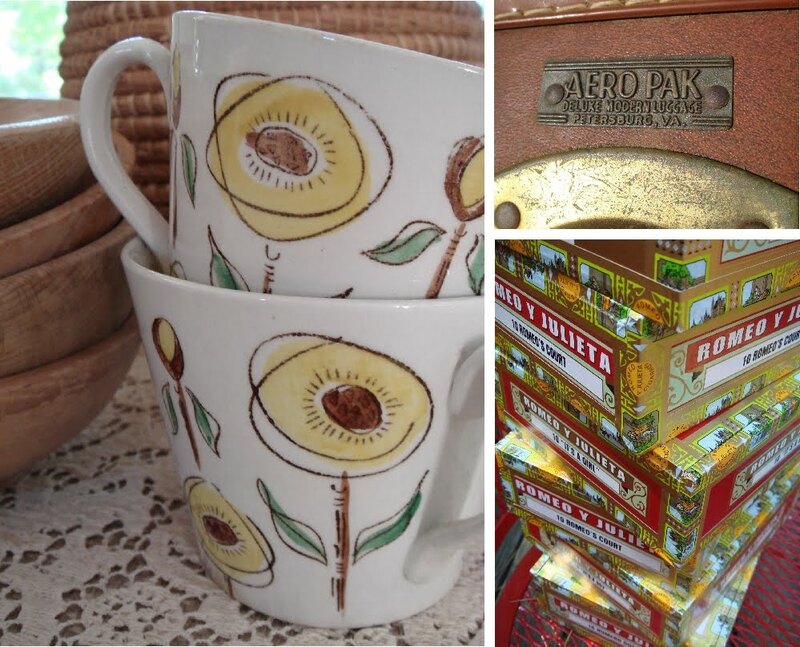 Old suitcases, wooden bowls, coolio neckties, sturdy cigar boxes, and even a pretty cup or two. Wooty woot! Hooray! Just got news that Robin and I have been accepted into the Bucktown Arts Fest this August, so if you're in the Chicago area, set aside some time on August 28th or 29th to stop by and visit our booth. 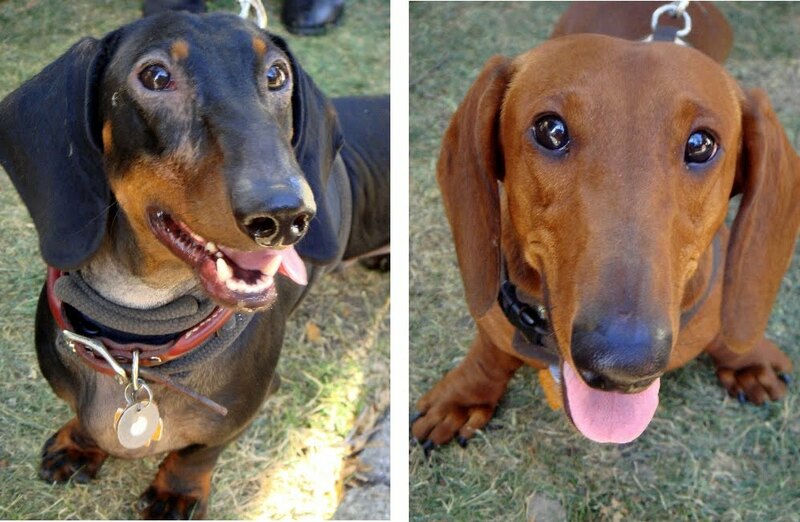 It would be an absolute pleasure to meet Baxter's blogfriends and all the wonderful doxies that call Chicago home. I can't even begin to say what might be in our booth as we have yet to make it, but rest assured there will be at least one purse that incorporates some of these swell retro vintage label ribbons that I scored during last Sunday's flea market foray. I love these ribbons - they're ever so summery yet with a vintage twist that will make whatever they're used on completely unique. Chumley was pretty enamored of them, too, though as always it was the mysterious and new smells that captivated our curious little wiener boy. Speaking of the wiener, Tiny chumley won't be able to join us, boo-hoo, but I am sure I will find a way for him to be there in spirit. Stay tuned as the details for this and everything else Bucktown roll out over the next couple of months! Boy, it's been a long time since I've been to the flea market. Hopefully, I haven't missed out on that special something I didn't know I even needed or wanted, but the fact is I just never know. 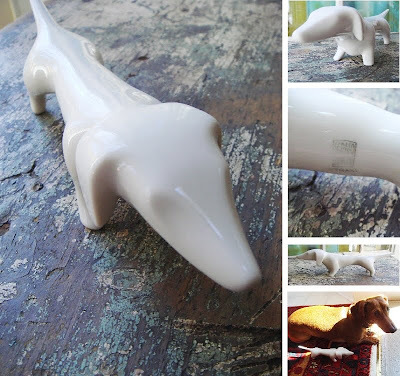 Things like this swell modern doxie, that I found at a flea market in New York City, before my crafty fingers took flight, before tiny chumley came into our lives and before I seriously cut down on collecting doxie stuff. I have no idea why it is I like the stuff that I do, or why I need such things in our home, but here I am, surrounded by the likes of doxies real and forever cast in a variety of mediums, by fabric and buttons and dye, by rusty weird things that I find really interesting. And by a little boyfriend and husband that let me be who I am no matter how many piles accumulate around them. For a few months now I've had the the back of my mind a burning desire to find a widget that would expand on the concept of a survey, that would allow friends to type comments, in response to all the little kielbasa's burning questions that he seems to have in life. Something I could put in the sidebar so it could stick around for a while, collecting input at everyone's leisure, just like the survey. I couldn't find anything that fit the bill, til I ran across this whole Facebook Fan Page thing. Minutes of tinkering later, my little boyfriend now has his own fan page. Now, I am the last person in the world to become a fan of anything in Facebook. Like my multipurpose camera/mp3 player/organizer/cell phone that I only use to make phone calls, I know I don't use Facebook to its full potential and I encourage others to be equally disengaged. But I became intrigued by the discussion page feature, which at first glance seems to fit the bill of what I wanted for open input survey questions. Click the icon, and leave your answer with the appropriate discussion topic. Voila! And if you are so inclined, do share links or pics of your pup on the home page. I know we all want to see!! Ahh design work. When I am in the right frame of mind, I could futz for hours designing stuff and poking around online print sites for customizable products and ideas and wondering about the weights of their paper and quality of their printing. And yet I don't have it in me to write most of my Christmas cards or thank you notes on a timely basis. 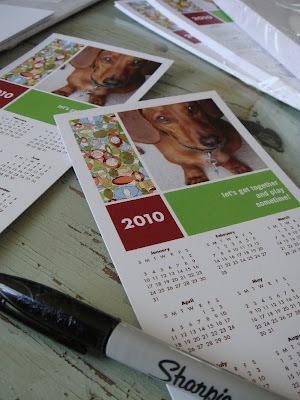 This time, I figured I'd try to stack the deck a little in my favor and find some motivation in writing belated holiday greetings and thank yous by ordering up calendar cards from an online print shop I wanted to check out. To my chagrin most of their offerings weren't fully customizable but I did find this happy design that I was able to update with an image of the shrimp scampy and some text changes. Plus they're 110 pound cardstock and printed in full color. Doesn't everyone get motivated by that? Making stuff for shows has been an interesting adventure, to say the least. Had I not taken the plunge, I would have never met my friend Robin, and had I not met my friend Robin, I would have never been doing a show in the studio of a marsh front home this past weekend, standing on the same street as lives Hootie himself, former pop star turned country singer Darius Rucker. Sounds almost glamorous, doesn't it? But I should also mention that had I not taken the plunge, had I not chosen to do this show, I also would not have been I have been sleeping in a chilly RV that hadn't been aired out in weeks, awakened in the middle of the night by the scratching noises of a mysterious animal that sounded to be a mere and alarming two feet from my head. All just a day in the life, really. I've learned over the years that sometimes it's best to let go of life's steering wheel and see where it takes me. Most of the time, it all works out, and because of that I can hardly complain when I am greeted by some nocturnal creature who would probably be just as afraid of me as I would be of him. I never saw what it was scratching away in the middle of the night, just as I never met Hootie. But just as Baxter lives to hunt another day, so must I walk in my valley of fabric, in search of hooties. One of the concepts on which we work with Baxter is a thing called "wait". A piece of kibble is unexpectedly dropped to the floor, and Baxter must patiently wait until he is given the okay to eat it. Most of the time, he does pretty well, but like any exuberant doxie he sometimes needs to be reminded of what it means to keep his impulses in check. If only humans were so easy. I have learned much about doxies since they first entered my life so many years ago, but I have learned even more about humans because of them. Hardly a human alive can resist the urge to pet a doxie, hardly an adult or child won't smile when they see a doxie just going about his daily business. Some human behaviors like these around doxies are universal, while some are very mixed. Baxter's dad has a thing for unflapped doxie ears, or more specifically, he has the irresitible desire to fix them so they're flapped back over, all back to nice and brown to hide the naked pinkness within. Every post is really for my dear husband, but today's post is especially so. I have to say the thought of my husband and I bringing Baxter to a doxie playtime seemed a little weird at first. I'm not particularly people-y, and don't usually get much joy in the small talk department, at least when all we're doing is standing around staring at each other for the sole purpose of socializing. My kind of social would have me and my peeps at a table, working the chit chat while we're all making something. Or lazing about in front of the TV. Or sharing the hunt at the thrift store or flea market. I never would have thought going to the dog park would be high on my list of things to do. 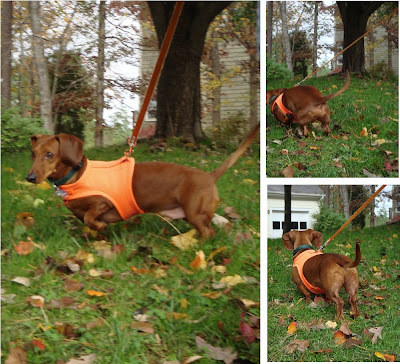 But throw a ton of doxies into the mix and the equation changes dramatically. Seeing herds of doxies doing their thing, sharing the joy with others who equally appreciate the scene. Not a bad setup, especially if you attend with no expectations. And Baxter usually loves it. We are fortunate enough to live in an area that seems to have a substantial population of doxies, but I would have never known that had I not googled around almost two years ago, looking for more info on Baxter's rescue organization. One thing led to another and I stumbled onto our situation. But here's a tip to save you time. 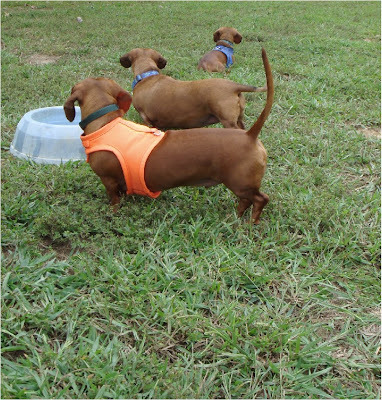 If you're inspired to find a doxie playgroup in your area (or start one), check out meetup.com and search on the keyword "dachshund" for your zip code. You never know, you may find out there's been a meetup in your area all along. 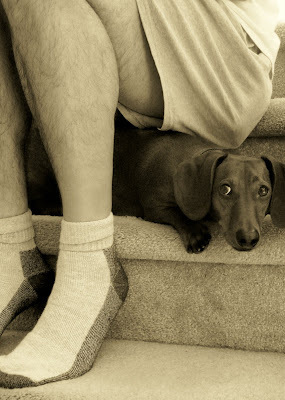 the cozy cave that formed between the stairs and Dad's legs called out to him. He mostly wanted to snooze but when this pic was taken he must have been startled by a noise from Dad's new cell phone, which Dad was playing with on the stairs. So it was a serendipitous snapshot, sorta like when you catch a snap of a hummingbird in midflight. Not much of a story, I know, but it just goes to show you how much more wonderful the human mind is at coming up with a story of its own! Happy Sunday! They say a picture is worth a thousand words, but have you ever wondered if the words really describe what's actually going on in the picture? Take a moment to post what you think is going on here, and we'll see if anybody gets the right answer in next Sunday's posting. Happy guessing!